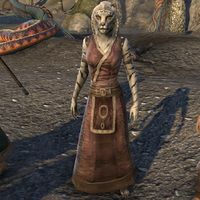 Harrani is the leader of the Khajiit community on Khenarthi's Roost. She is a party to a treaty with the Maormer of the island, representing her people. However, she has recently had her copy stolen. After the treaty is retrieved she will provide clues, through her report, which will unravel a Maormer conspiracy. Meeting her at the Mistral Chancery at first, she is not very happy about the Dominion presence: "I won't endanger generations of relative peace with the Maormer. Not for some faraway ruler who is freshly installed on her throne." The Silvenar will direct you to speak with her and Ulondil for a copy of the treaty. Harrani will formally welcome you to the city. "It's hard to keep track of the new faces since the hurricane, but I don't believe we've met. Welcome to Mistral. May your stay here be full of warm winds and soft sand." The Silvenar wants to see your copy of the treaty. "And I told him, the mere act of doing so would complicate matters with our long-time Maormer allies. They take great offense to the Dominion's claims upon our island." Why did you sign a treaty with the Maormer? "Look around you. What great armies do you see? Our survival depends on knowing when to fight, and when to please. The treaty brought us prosperity for generations. I will not be the one to break it." After some advice from Razum-dar, you can steal Harrani's copy back from the Embassy. Unfortunately, when go to hand it over to the Silvenar, you will find that he has been killed. The Green Lady, will demand that you question Harrani for any leads. "Not again. Please, I understand what the Silvenar desires, but I already told you. We cannot provide him with our copy of the treaty." "Dead? But he was just here! What happened?" The Green Lady suspects murder. "How awful. Who would harm such a peaceful creature?" "My guards saw nothing. We doubled the watch to ensure safety! I cannot abide the Silvenar's murder in my town. I'll shut down the port if I have to. None set sail until his killer is brought to justice!" "Of course. I hereby declare you a deputy of the Mistral Guard. No door shall be barred to you." "On my desk you will find the most recent reports from the Mistral Guard. You are welcome to review them for any inconsistencies that could lead to the killer's capture." After announcing the Silvenar's death, Harrani's guests will have their own opinions. Harrani: "How dare you! The Silvenar was our guest! You go too far, Vicereeve!" Once you have read the reports, she will tell you, "All of Khenarthi's Roost prays the Silvenar's killer is found, and quickly." Your investigation will lead you and the Green Lady to the killer, who admits to having obeyed Ulondil's command. When you go to confront Ulondil, Harrani and Pelindil will be with him next to the bridge to the Embassy. "Your friend Razum-dar showed me what you found, but the treaty binds me! Unless the ambassador himself was involved, I am powerless." When confronted, Ulondil readily admits to being involved, though his smug tone changes when he realizes the Green Lady is still alive. At this Ulondil will give a final ominous proclamation before fleeing, with the Green Lady following close behind. Harrani expresses her anger about this but asks you to intervene between the Green Lady and her quarry. "This is madness. There has been enough death in this city!" It's clear the Maormer betrayed Khenarthi's Roost. "This does not excuse mindless slaughter! We are better than our enemies. You must apprehend him. Don't let the Green Lady cut him down like an animal! We must learn what the Maormer plan for Khenarthi's Roost." "I trust you'll do what's best for my people. Now I must … apologize to Vicereeve Pelidil. Whatever the Dominion needs, we will provide." I don't have time for this. I'm going after them. If you talk to her again before dealing with Ulondil, she'll say: "Please, bring Ulondil to justice." "Where is former Ambassador Ulondil?" I left him with the Green Lady. "Another honored enemy we must send to the Temple of the Mourning Springs. Too many, today. No matter. Before he fled the embassy, Ulondil mentioned something about a "tempest". Did he say anything about this before he died?" "I fear we'll learn soon enough. What a nightmare! I hope all dealings with our Dominion allies won't end this way." Have you officially joined the Dominion? "I signed a new treaty with Vicereeve Pelidil moments ago. He assured me the Dominion will defend our little island from any reprisals, Maormer or otherwise. Khenarthi's Roost will see much change to come. We must grow together, or we shall die apart." "We've taken Ulondil into custody, thanks to your quick action. No treaty will keep him from proper justice." The Green Lady wanted to take revenge. "I understand. I am certain she'll find another way to mourn her husband. I asked Ulondil what he meant about the "tempest." After what the Green Lady did to him it is difficult for him to focus, but what he did say isn't good at all." "The Maormer have some ships waiting offshore. Ulondil's people signaled them before the Green Lady arrived. Some sort of invasion force. With the Dominion's help, perhaps we can fortify the town. That alone may save many lives." "I signed a new treaty moments ago. Vicereeve Pelidil assured me the Dominion will protect our little island. It's a new beginning for Khenarthi's Roost. We will prosper or fall—together." In both cases, this concludes the quest and you receive the Queen's Own Cuirass as a reward. Talking to her after this, her response depends on your previous choice. If you spared Ulondil, she'll say: "Even our worst enemies deserve respect. I admit, I'm glad to be proven wrong about Dominion justice." If you didn't, she says: "There's much work to be done, but the people of Khenarthi's Roost are up to the challenge." She is part of the crowd that greets you in Cat's Eye Quay after disrupting the Maormer ritual. "Today you saved Mistral from destruction. Khenarthi herself must watch over you." This page was last modified on 9 March 2019, at 03:59.